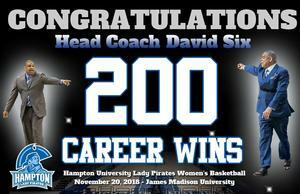 HAMPTON, Va. (Nov. 21, 2018) — Hampton University head women's basketball coach David Six, the school's all-time wins leader, captured his 200th career win at the helm of the Lady Pirates when they rallied in the fourth quarter to defeat James Madison University 72-65 on Nov. 20 at the Hampton University Convocation Center. "I would like to extend my congratulations to Coach Six for another outstanding accomplishment," said Hampton University President Dr. William R. Harvey. “Since his arrival at Hampton University, he has done a masterful job in all aspects of our program. Over his tenure Coach Six has maintained strong coaching staffs while recruiting and developing great Lady Pirates players both on the court and in the classroom. I look forward to seeing many more milestones in his career." Six's first win at Hampton came on November 19, 2009 in his first contest as Hampton edged William & Mary 71-66. That same season he earned the first of his six MEAC Tournament titles defeating South Carolina State 57-46 on March 13, 2010. The win over South Carolina State started a string of five straight tournament titles as Hampton defeated Howard (2011, 2012, 2013) and Coppin State (2014). The sixth MEAC crown for Six came on March 11, 2017 when Hampton defeated top-seeded Bethune-Cookman 52-49 at the Norfolk Scope. His 50th career win came against South Carolina State on Dec. 3, 2011 (73-41), while number 100 came at the start of the 2013-14 season with a 64-37 win over Saint Peter's on November 10, 2013. He tied the school record held by James Sweat on Jan. 3 as Hampton rallied in the fourth quarter to defeat Columbia 60-58. Sweat went 183-40 in eight years from 1981-88 as Hampton was a NCAA Division II power. During Six's tenure, the Lady Pirates have won six MEAC Tournament titles, six NCAA Tournament appearances, five MEAC Regular Season crowns and earned a bid to the WNIT in 2015. Prior to being named the Lady Pirates' head coach, his first collegiate coaching job, Six spent a year as the Director of Intramurals at Hampton University. That position came after Six established himself as one of Virginia's top high school coaches, embarking on a career that saw him win 331 games over 14 seasons and take home two state championships (2001, 2007). Six was a two-time Virginia High School Coaches Association (VHSCA) Coach of the Year, and in 2007 – after leading Hampton (Va.) High School to the girls state title – he was named Associated Press Coach of the Year. The Lady Crabbers were 30-2 that season. During his time at Hampton High School, Six was instrumental in helping more than 30 players receive basketball scholarships, while transforming the Hampton High girls basketball program into one of the elite programs in the country. In addition to his two state titles, Six won one regional title, made 10 regional appearances, made five state Final Four appearances, won nine district titles, and won nine district tournament titles. From 1996-98, Six was the boys varsity coach at Gloucester (Va.) High School, where he twice led the team to the Peninsula District Tournament. He is the only boys varsity coach to ever qualify for the district tournament at Gloucester. The Lady Pirates will return to action on Wednesday, Nov. 28hosting Samford University at 7pm in the HU Convocation Center. For more information on Hampton University women's basketball, please contact the Office of Sports Information at 757-727-5757 or visit the official Pirates website at www.hamptonpirates.com.